14K gold. 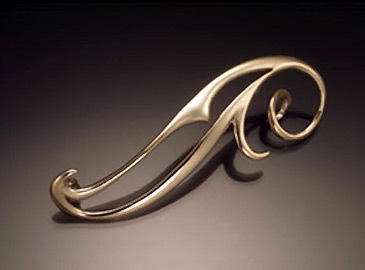 Graceful and flowing, this pin is perfect on any lapel. 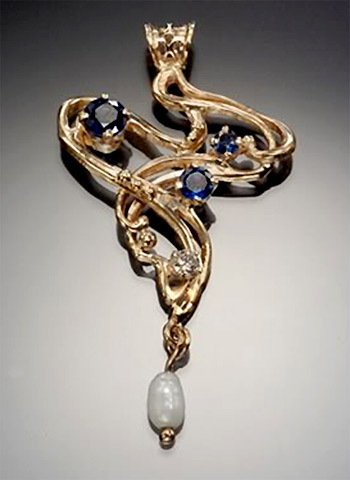 Jewelry of Chardavogne was established in 1970 by Jacques Hemsi. He specializes in hand-crafted and gold jewelry that is original, beautiful, and easy to wear. His hand-wrought work is an imaginative blend of filigree, applique, interlocking planes, twisted wire, and an endless variety of other three-dimensional techniques. Every January through March, Jacques Hemsi, at his atelier, creates new designs by working directly with the metals. He then makes his own molds and castings. This allows him to modify designs according to which stones are used as well as the specific requests of his customers. 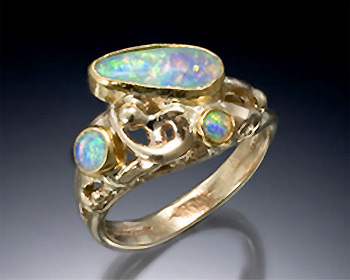 Jacques Hemsi’s original designs have been well-known at prestigious juried craft fairs since 1976. His many returning customers can always count on finding their old favorites as well as something new.